Traditional cuisine intersects with a distinctive modern sensibility at Sorano-niwa. Newly opened on one of Ebisu’s quieter back streets, this is an almost textbook example of how some of Japan’s most representative foods are being updated and repackaged for the new millennium. The design motifs are all 21st-century wabi-sabi. A sturdy wooden door slides open to reveal bare concrete and exposed lighting ducts. The walls have been given the packed-mud, raked-sand look, but the zasshiki seating areas are floored with luminous green plastic, not tatami. 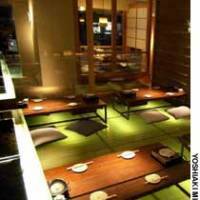 The waiters wear jackets of slub cotton and the restroom floor is a pebble-strewn rock garden. But the airwaves are filled not with the plaintive twang of koto but contemporary R&B. Sorano-niwa — the poetically named “Garden of the Sky” — specializes in traditional soy products. That means tofu in its various guises, of course, but also yuba, the skin that forms on the surface of soy milk when it is heated; and unohana (a.k.a. okara), the fiber-rich soy lees left over from the tofu-making process. These are foods most often associated with the rarified (and overly-formal) temple cooking of Kyoto. 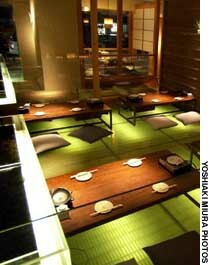 Here, however, they are given a more down-to-earth treatment, worthy of a modern urban izakaya. This is obvious from the complimentary otoshi, served as soon as you sit down. It is not so much an appetizer as a manifesto of intent. The small oblong plate will display a miniature “sushi” roll of pressed unohana wrapped in thin layers of nori and fresh yuba; a delicate dab of their specialty yukimi-dofu, which owes its rich, smooth texture to the fresh cream that is added to the curds; and a few pods of edamame — not any old green soybeans but gourmet kuro (black) edamame from Tamba, the fertile agricultural area above Kyoto that is still considered the larder for the old capital, and much of the rest of Kansai, too. To start things off, order a basket of the deep-fried yuba chips. Crisp, light as air and liberally seasoned with salt to balance their rich, eggy flavor, they go perfectly with that first bottle of Kirin, while you work your way through the substantial menu. From starters through to salads and specials, and even dessert, you will find very few dishes that do not feature either soybeans or their derivatives. Two notable exceptions are the carpaccio of madai (sea bream), which we did not try; and the hitoban-nekaseta buta no kakuni, which we did. The slices of long-simmered pork, which as the name suggests is left overnight (to improve the flavor) — taste surprisingly unfatty, and every bit as melt-in-the-mouth delectable as they are supposed to. From the page listed as “original creations” — most of which are in fact variants on well-established themes — we particularly enjoyed the tofu shumai. These steamed Chinese-style dumplings were made of tofu mashed and mixed with shrimp, kaibashira (scallop holdfasts) and yurine (lily root), wrapped in yuba and topped with a single red wolfberry. They offer a selection of deep-fried dishes, and a number of salads — including an intriguing but not entirely successful take on a Caesar salad, made with real bacon bits but using deep-fried morsels of age-dofu in place of croutons. But the star of the show at Sorano-niwa is the dish known as hiki-age yuba. A small electric heating unit is placed on the table, and on top of that a rectangular tray containing deep yellow soymilk. As it slowly heats up, a skin starts to form on the liquid (just as it would on cow’s milk). When this skin is thick enough, you scoop it out with your chopsticks, then wait for the process to repeat itself. Freshly prepared yuba is a rare luxury, never more so when it is still warm from the pan. Season it lightly in the special wari-joyu dipping sauce, into which you will mix sesame seeds, chopped scallions, grated ginger and the freshly-grated zest of a sudachi citron. The taste is fleeting but memorable — and even more so for having just watched the yuba form in front of your eyes. As an alternative entertainment, you can make your own tofu at the table — or at least sit back and watch the curds form on their own accord. Both forms of alchemy are equally rewarding to the palate. They are also (at 1,200 yen) the most expensive entries on the menu. Nothing else is over 1,000 yen. This izakaya pricing applies equally to the drinks. There is a small selection of sake, including Kyoto stand-out Tama-no-Hikari and one of our old favorites, Ginban 50, an intensely flavorful junmai daiginjo from Toyama for just 880 yen per serving. The only disappointment of the evening was the quality of the yaki-onigiri rice balls. Not only were they barely formed into creditable patties, they were cooked so fast they were scorched on the outside. And adding insult to injury, they were then slathered with a dengaku-style miso sauce that was so sweet it was virtually inedible. It certainly put us off the idea of dessert. And that was a pity, as the concept of black soybean blancmange and tofu tiramisu cried out to be tasted (if only in the name of science). Like many things at Sorano-niwa, these are strange fusion ideas. Judging from those we tried, they will work equally successfully. Beer from ¥500; cocktails from ¥600; sake from ¥570; shochu from ¥480; wine from ¥550/glass, ¥2,800/bottle. From Ebisu station (East Exit), walk down to the Mizuho Bank crossing (by Kinko's) and instead of walking along past Zest Cantina, take the small sidestreet on the righ that runs parallel . Sorano-niwa is on the right after about 200 meters.